» Try out the Climbing Apps! Convert climbing grades, get your ape index & more » Try out the Outdoor Calculators! At first sight, the search for the appropriate rope pulley seems to be a difficult task. There are numerous kinds of rope pulleys in various designs, which are fit for a great range of purpose. As an example, extremely lightweight rope pulleys are applied for mountaineering and help to set up a pulley quickly. However, bigger rope pulleys such as tandem pulleys, come into use in high-ropes courses or for rope bridges. What types of rope pulleys are there? 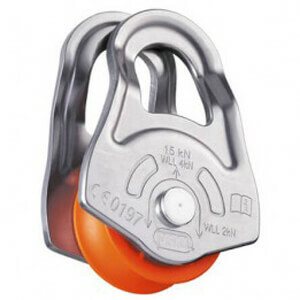 Rope pulleys are categorized into load, auxiliary and emergency pulleys. Load pulleys are the strongest pulleys and also have the highest breaking load. Usually, they also contain a closed stem which prevents the rope from falling out of the pulley in case of a broken axle. The guide roller of such a rope pulley is usually made of steel and aluminum. Auxiliary pulleys are often haven movable sides and partially, plastic pulleys. Therefore, they are much lighter, but less robust as well. Emergency pulleys are very lightweight and are often made of plastic. However, they are meant to be used for emergencies only. What makes for a good rope pulley? A good rope pulley should have a high-quality bearer as well, since it clearly decreases the friction in the system. Like this, you will clearly need less energy to pull a rope bridge and a double rope pulley works much easier with the help of a great bearer. Since the rope pulley definitely is a part of safety equipment, one should always look for high-quality and take appropriate breaking loads into account. A good and high-quality rope pulley will provide you with much more fun and will be very durable and long-lasting as well.